Microgaming, the world’s leading developer of online casino software, with the collaboration of Plank Gaming, has released a new slot game titled ‘Neptune Rising’, with Microgaming having exclusive rights over the game. Neptune Rising slot game is an Ancient Rome and mythology-inspired slot that will be available for play at all Microgaming powered online casinos. The new 5 reel, 3 row and 10 pay line slot game can be played from between 0.20 and €50 per spin and offers players lots of winning opportunities as well as a massive 9,000x Jackpot. 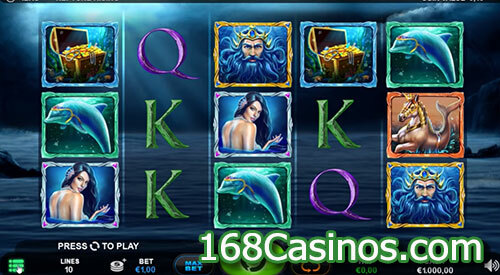 Symbols on the reels of ‘Neptune Rising’ include the god of sea Neptune himself, dolphins, treasure chests, mermaids, sea horses as well as 9, 10, J, Q, K and A playing cards which act as the slot game’s lower-value symbols. The highest paying symbol is Neptune himself that could award winnings of up to 75x a player’s stake if five of these symbols land on the same spin. The Neptune Rising feature can trigger randomly in the base game on any non-winning spins to produce modifier extras for enhanced wins. Entering the Bonus round guarantees a win on each of the 10 Free Spins which can be re-triggered indefinitely. Microgaming is well known for allowing its smaller, independent developers to release their gaming titles under their name and Plank Gaming is one of the most recent Microgaming line-up additions. Players will note the slot game’s ‘state of the art’ graphical solutions and beautifully rendered symbols with the very first spin.